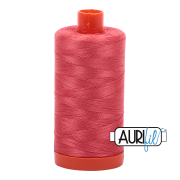 Aurifil thread 100% cotton mako 50wt 1300m. This thread is great for piecing, embroidery,applique, and quilting. The colour is like a dark coral red.